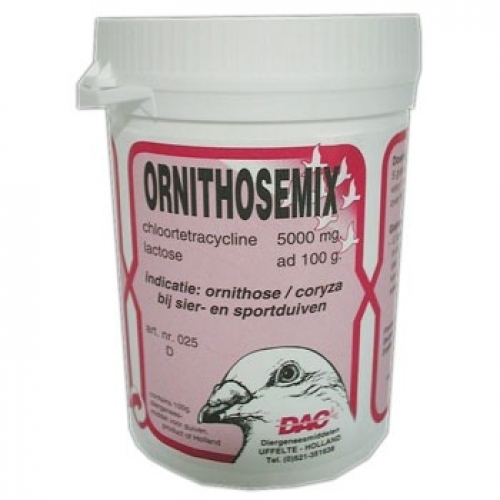 Ornithosemix 100 gr by DAC is a highly efficient compound for treating ornithosis and Coryza (Mycoplasmosis). - 5 grams per 1 ltr drinking water (20/25 pigeons) during 5 - 7 successive days. - In the drinking water: Dissolve the dose in water to drink pigeons to try for a day. Note that in hot weather drink more water. - At lunch: Moisten the seeds of cooperation with yogurt or with natural fruit juice and sprinkle the dose of medication.